We just had the last Sunday Challenge for this year last weekend. I was a little fatigued from all the holiday activities and lots of eating and drinking, but it did not stop me from taking the new challenge. In this case, we played the "deconstruction" challenge where I was given a traditional dish and asked to deconstruct it for the meal. 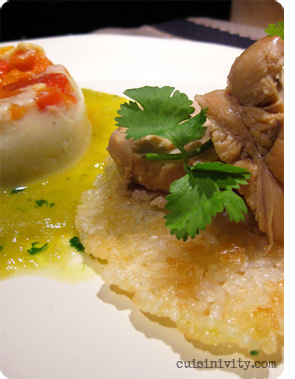 What I Made : Coconut milk pudding, roast chicken with fish sauce, crispy rice cake, green chile sauce, and cilantro oil. My note : It did not take me more than 30 seconds to come up with the idea of coconut milk pudding as the "soup" base. But the challenge was figuring out how to make it savory rather than my usual sweet version I sometimes serve as a desert. I got a hint from a Japanese traditional savory egg custard (chawan mushi). For the chicken portion, I wanted to use a fish sauce and lemon glass for the flavor. The missing ingredient was green chile and cilantro and I decided to make two sauces. I could just serve the rice normally, but I thought it would be fun to make something different. I love lightly burned rice at the bottom of the pan and I thought a crispy rice side made to resemble that crunchy rice texture would give some contrast to the creamy pudding and soft chicken. Judge's verdict : A very impressive concept. Immediately upon seeing the component parts of the dish, I was captivated how each key ingredient had been altered in some form or another, yet all were there in such a recognizable combination on the plate. I particularly liked how the curry soup was turned inside out: the soup base became a solid while the usual chunky chips (chilies and herbs) that float around a traditional curry were now liquid. The chicken itself was tasty, albeit not cooked or presented in a very novel form. But the crunchy rice cake was a really nifty idea. So an "A" for concept and presentation. Regrettably, however, the dish did not taste as good as it looked. The problem with deconstruction is that the flavors that mix well together in the original dish don't always have a lot of flavor when eaten alone. If I tried to carefully take a piece of the rice, put on a chunk of chicken, scoop a bit of coconut mouse, and dip it in the green chili sauce, I got a pretty good bite. But leave out one of those from your spoon, and you could tell something was missing. The star of the dish really was the coconut soup flan, and it had enough flavor to eat alone. But the green sauce was a little bland. One thing I thing would be interesting would be to only half-deconstruct next time: put the herbs and spices back into the flan so that essentially rather than a deconstructed curry, you have a solid curry. Still a novel and fun concept, a great gimmick for the party, but with enough flavors combined to keep the dish flavorful.